the first one is a small cardi which was for a really long time in my Ravelry queue (since it was published actually) : (Petit) Arc-en-ciel by Solenn Couix Loarer. I decided to not make colorfull stripes. Instead, I worked white (col. Sel) stripes on the grey background (col. Goéland) to get a really soft and sweet cardi (soft was my word for 2016 and it will certainly be too in 2017…). I’m in love with this yarn, it is soft, light, fluffy, warm… I don’t have enough word to tell how much I love it. It is one of my most favorites yarn and I have lots of projects, finished and to come, in it. I can only recommand it ! I used (again) Ulysse from De Rerum Natura (I’m in love, I tell you !) : col. Sel, Doré and Goéland. Knitted with 3-mm needles, it gives a dense but still soft ans squishy fabric… I love it ! 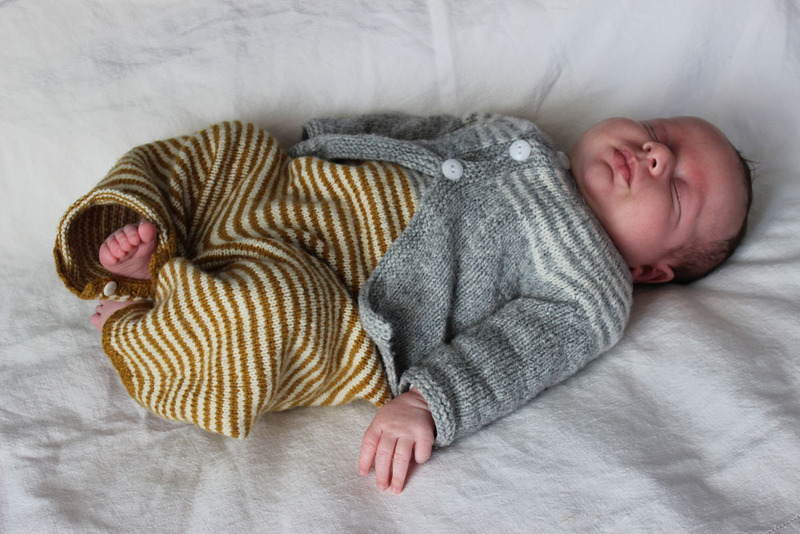 Initially, I had plan to knit the jumper all in yellow and white stripes. Unfortunately, I got to the end of my Doré ball of yarn before I finished the body. Instead of ordering more, I dove in my stash and chose this soft grey (the same as the cardi). I don’t regret it : I find the result really classy and sweet !